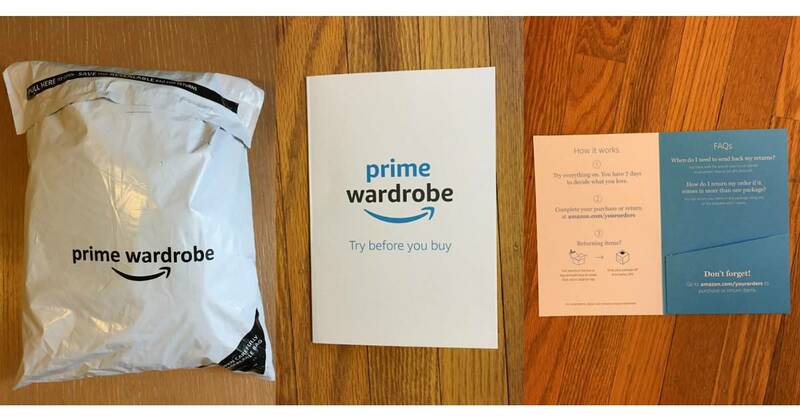 Now that Amazon is expanding its try-before-you-buy feature to more customers, we thought it’d be a great time to share a review of Amazon Prime Wardrobe. 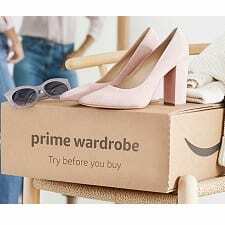 Last summer, when Amazon originally announced Prime Wardrobe (presumably created to compete with Stitch Fix, Trunk Club, and so on), it wasn’t available to all Prime members — and it still isn’t. Currently, the FAQ says, “Prime Wardrobe is currently available by invitation to Prime members. Prime members can request an invitation at amazon.com/pw-learnmore.” I never requested it, so I guess I just got lucky (although it could be because I’m a very frequent Prime user). Psst: Regarding online shopping in general, we’ve also talked about how to get your money back on returned online purchases, the best online shopping apps for deals and more, and had a great discussion with readers on their favorite online shopping destinations. You can try 3–8 items for 7 days, and you pay nothing when you order. You don’t get 2-day Prime shipping — it may take several days to get your order. You can keep anything you want from your order, and you must send the rest back within the 7-day period. If you keep more than $200 worth, you get a special $20 launch discount. I figured that trying various bras would be a particularly good way to use the service, especially because I had recently ordered a couple of them individually and then returned them to Amazon (through free returns) when they didn’t fit. On April 13, I ordered eight bras in various styles and sizes. The checkout process was just like the regular one, although I had to agree to the Prime Wardrobe terms and conditions and “pay” $0.00 (rather than $400+). I was later charged a temporary fee of $1 to verify the card. The shipping estimate was 4–6 days (or possibly 5–7 — I can’t remember), but I received the items on April 16, when I also got an email confirming the try-on period. I logged into my account to see “Try at home until Mon, April 23” and “7 days left.” Amazon says they send reminders, too. 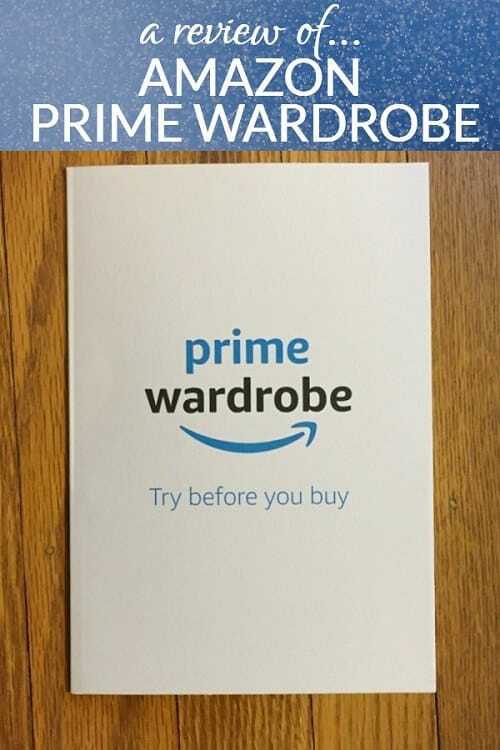 If you’re an Amazon Prime member, do you have access to Prime Wardrobe yet? If you’ve used it, what did you order, and how did it go? If Prime Wardrobe isn’t an option for you yet, what sorts of things do you think you’ll use it for? When you’re shopping online in general, do you usually order two or more sizes of certain things and plan on returning the rest, rather than one size/item at a time? Ed’s note: We do have a business relationship with Amazon (you can read more here), but this post was written without editorial involvement or encouragement from Amazon. Unless I had an unusually low credit limit on my credit card, I’m not sure why I would ever use that service. I just order things from Prime, put it on my credit card, get 2 day free shipping, and return anything that doesn’t fit for free. They usually process the credit to my card within a day or two of the return getting picked up, so there is never any issue about not paying my bill in full before it’s due because it all just reverses. Could anyone help me to understand why someone would need/want to use this service? I don’t have a low credit card limit (I use maybe 10-20% of my available credit on a monthly basis) but I almost never order a bunch of stuff just to try on. Sometimes I’ll order two sizes of something but I wouldn’t, say, order 5 pants in two different sizes each just because I’m looking for pants. I think there are a few reasons – I have my cards set up to alert me to certain limits as an informal way of staying on budget and this would mess that up somewhat, also I’m much more likely to keep something that’s “not quite right but close enough” when I already paid for it vs. when I have to decide whether to pay for it, and, yes, I just psychologically dislike the idea even if it doesn’t actually affect me at the end of the day. I guess none of those are really good reasons if you like doing this sort of thing, but they’re enough to keep me from shopping for clothes on amazon so it seems like a smart thing to do on their part to encourage more people to shop. I’m with you! I buy a ton of stuff, get 2-day shipping, and return it. Amazon Prime is a lifestyle for this busy working mom of two. I don’t see any benefit to this service. For one, not everyone shops with a credit card. I wouldn’t dream of buying clothing on credit. So this would be outstanding amount on my debit card/from my bank account. I ordered $988 worth of stuff my first try of APW (only because one was a nicer purse). So, no. That’s, like, my kids’ tuition payment. It would annoy me to have that hole in my bank account, even just for 7 days. Ooh, this is such a good use of the service! I vaguely heard about the new option but hadn’t looked into it much. I do need new bras and it’s always a hit or miss experience for me, especially now since I’m nursing and finding a good variety of nursing bras to try in person isn’t easy either. I was going to just order a whole bunch from a place with a good return policy but that’s actually hard to find in this context and I was a little hesitant to incur a large CC charge to try on a whole bunch, however temporarily. Going to check this out ASAP, thanks! I do this for Nordstrom and just incur the charge and make sure to return before the next bill date. I just saw I have it. This might be good since I am losing weight. Spa day? Or maybe just book a haircut for the morning and then have a nice lunch somewhere, take in a show or go to a museum or just go shopping without crowds. I try to never go to work on my birthday and I’ve come to prefer weekday birthdays now as a result. One of my unexpected favorites was a lightly rainy day where I went to the movies and sat by a window in a nice restaurant for a late lunch with wine. I take my birthday off every year. I take myself out to a nice breakfast or lunch, then go to a museum or an arboretum or a movie or get my hair done or whatever I feel like. As soon as Amazon wardrobe kicked it the price for *all* of my merchandise in my shopping cart went to 100% while the day before every item was discounted at least 25-40%. This is not a customer-friendly business practice. For the past 2 days none of the prices went down. I will not buy anything at full price. It looks like I will use Amazon much less from now on (have been Prime member for many years). It’s a shame. I’m not sure why the main point is missing from this service. I have a problem with shipping online since having my baby so I thought this service would be great. I added 3 things to my amazon wardrobe cart which is the min. I was charged 1.00 to verify the card. A few days went by and I received an email on the day the items were supposed to be shipped to me. The email read to authorize my card for the full amount of the order and during that period the funds will be unavailable even if I canceled the order after authorization. So basically you are being charged for the items prior to keeping the items. Of course this doesn’t change anything when shopping on amazon but it is very misleading to say “you will not be charged during 7 day period.” I appreciate that I was informed that I needed to authorize the payment before they just charged it. Thanks for the comment. I did not get an email like that either time I used the service a couple of months ago, so perhaps it’s a new thing they’re doing. That’s good to know! Okay so i was gonna place my order right before I get paid. The funds need to be there to get it shipped. I was under the impression that as long as I have it there after the seven day period it would be fine. I too was under that impression. I told them when I went to a store to try on things I didn’t have to show them I had cash to pay for it. I tried to order 3 pair of shoes for my kid. Was thrilled i didn’t have to go to the mall but I didn’t have the full amount in my checking account so they didn’t send it. For me, its useless. I don’t like the idea of buying ‘new’ clothes from Amazon Prime Wardrobe. Am I the only one who wonders how many times the expensive clothes I am ordering has been sent and returned? Yes, true, some items are purchased and returned. Maybe it’s the 7 days trial that I don’t care for. Or growing up with a sister who commonly purchased items of clothes, wear them, and return them later. I shop at Zappos frequently, and will be buying my clothes from them in the future. I’m having issues with my feet and need to wear inserts in my shoes. Do I need a half size larger, a wider width, or both? Ordering the shoe in these three size changes will help me decide. I will then return the other two. This is perfect for me! Where I can see the clothes I like to buy? Just tried this service recently which is late August, early September of 2018. The front end of the experience is fine as the items arrived quickly and I didn’t have to authorize the full payment during the trial period as indicated in an earlier comment. Maybe Amazon changed the policy? Three of the four items were returned and delivered to the Amazon facility as indicated on the Amazon provided UPS labels. The items came in two boxes so Amazon provided two labels. The three items were sent back in the two boxes they came in, respectively. Four days after the returned items were delivered to Amazon, I received an email from Amazon indicating that two of the three items were not returned and my credit card will be charged for the returned items. I contacted Amazon and was told that it takes up to five business days to process returns after items arrived at the Amazon return destination. I did not receive an apology for having to waste my time getting this situation sorted out. Instead, I heard excuses. As it turned out, the Amazon system was able to process the return items the very same day the email was sent. 1. The notification email should only be sent AFTER Amazon completes processing. In this case, the email should never have gone out before five business days after the return items had arrived. 2. The time frame for Amazon to charge for unreturned items should be extended accordingly. Amazon has the ability to be notified by UPS when a return shipment is dropped off at a UPS store. I have worked in the IT field for over thirty years so this is clearly an oversight in designing the return system. Amazon could have done better both in the system design and the way the rep handled the situation. This will be the last time Amazon Wardrobes got my business. Try Trunk Club. They have been doing this type of business for years. They know what they are doing. Amazon is just trying to monopolize another business model, but not doing it well. I used Prime Wardrobe, but I stopped, because it was very difficult to find clothing items in my size and color and price range. To answer the person who can’t figure out why one would want Prime Wardrobe? I don’t make it a habit of returning, it’s such an unpleasant task, so this seemed like an easier return, since one doesn’t pay for it yet. Another reason why I like Wardrobe is that I chose top designer gowns and purses that I otherwise couldn’t afford. I did not have to have that dollar amount already on my credit card. I was sent all that I asked for. It was very fun to try on such luxurious outfits. But then I noticed a clause that if Amazon felt you wore anything for even a minute past just a try on, they would charge you for that item. That gave me a jolt and I no longer was comfortable using Wardrobe. I did find one dress that I loved, but alas, I have to save up money for it. I have used prime wardrobe twice now getting 1000.00 worth of each time looking for designer dresses for my son’s wedding in the spring and after trying on several have fallen in love with one I saw in a bridal shop which was 150.00 less on prime. I also ordered another outfit for the wedding but when it arrived it was only a jacket and no dress. I called Amazon and they credited me immediately and never was charged any fees. I hate shopping in stores and being a plus size, it’s hard to find dresses that fit and look nice. I’m sold on this service. I’ve done it once, bought 3 sports caps. The size I thought was right and the one size smaller and the one size larger. The size I thought was right was not. I needed the larger once. Normally I would have bought the one I thought was correct and then the larger, 2 orders. So for that it saved time. Sure I could have ordered the 3 caps at once and returned 2 of them but I don’t do it that way. Either way getting clothing in 2 days or 5 days doesn’t really matter to me. Now they just need to add Prime Hardware or Prime Electronics.. I like the incentive to return the items quickly so you never get charged.